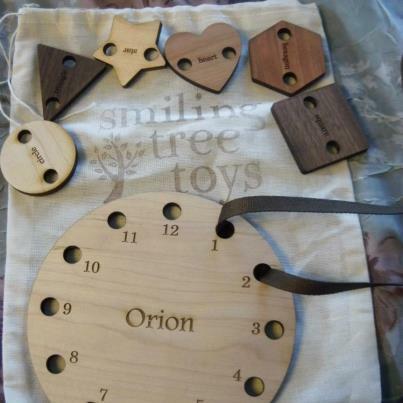 Review of Smiling Tree Toys located in Lamberton, MN: Educational, developmental, eco-friendly toys for baby, toddler, and preschooler – Waldorf and Montessori inspired! I have to say, I love EVERYTHING about this “company”. I put that in quotes because this is truly a mom/pop operation, and exactly the type of family business I want to support, and encourage you to support! Please browse through these few pictures to meet Justin, Kathleen & their little girl, and view the beautiful location where they lovingly make their toys: (https://www.facebook.com/media/set/?set=a.183624011683796.38574.183542891691908&type=3). Compare what you just saw, a true family operation, to Melissa & Doug, or any toy, made on an assembly line in China, and tell me which you feel is more worthy of supporting with your hard earned money…. Every, single one of the 177 items in their Etsy shop are simply adorable, and I’m very impressed with the selection- here are some of the categories of offerings, but you have to take a look for yourself: cars, rattles, alphabet blocks, wood teethers, personalized toys, baby’s first ornaments, stackers, nursery decor, wooden stools, personalized gifts, and other educational learning toys: www.SmilingTreeToys.com. I feel their prices for these beautiful handcrafted toys are very reasonable, with most of them ranging from $10-$30! Here’s some info from their site about their products and the materials used: “Sustainably harvested, American grown hardwoods — homegrown organic finish – expert and caring craftmanship — we love what we do and that shines through in every aspect of our family business!” (it TRULY does). Also, as former Peace Corps volunteers themselves they “donate to Peace Corps youth development projects for every toy sold – you help us circle the earth with smiles ”. What’s NOT to love?!? They have feedback from 1885 transactions on Etsy and 100% of it is positive (which is saying a LOT)!!! They very graciously sent me a personalized lacing toy for my son to enjoy, and I have to say, he’s had a LOT of fun with it. He recently turned 2, and is really into puzzles. I love this alternative to a standard puzzle, and it has many different fun aspects: numbers, shapes, tracing, and it helps develop motor skill coordination while having fun. The only shape he knew before using this toy was the star, however, within a few times using it he was both saying, and identifying the hexagon (hearing hexagon in a 2 year old voice is just SO cute). Sometimes he laces using the shapes, sometimes he just laces without the shapes, he loves poking & pulling the laces through. This gorgeous toy retails for $24 personalized, that seems incredibly reasonable to me!! **Our Green Guarantee** We do everything we can to be kind to Mother Nature. We use local and/or sustainably sourced hardwoods, recycled packaging materials, natural cotton bags, and other earth-friendly materials. Every Smiling Tree toy arrives with Mother Nature’s blessing and is radiating with GOOD VIBES and HAPPY THOUGHTS, we guarantee it! Learn about more ways we keep our eco-footprint small and green:http://www.etsy.com/shop/smilingtreetoys/policy. I know Christmas is over, but next time you need a birthday or baby shower gift for that special child in your life, or maybe your babe is now teething, or needs some educational toys (doesn’t have to be a special occasion), please remember the wonderful selection made by this beautiful family on their small Minnesota farm! Previous Fiddlebump’s Apothecary Next Natural laundry solutions- soap nuts & wool dryer balls!